Incredible new construction custom beach home with pool! Talk about an incredible beach home opportunity! This sensational new home is everything you have been dreaming about! From the wide open spaces, loft style modern design, 20ft wall of glass, to the beachfront pool and more, this home has it all! Built by one of the area’s most respected builders, this beautiful new home offers you 3 bedrooms each with their own private bathroom, as well as a half social bathroom and half pool bathroom. The kitchen is modern and open to give you plenty of counter space, while at the same time giving you the beach views to enjoy while cooking your favorite meals! 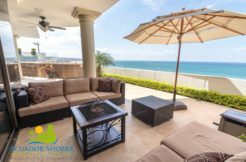 The home offers a lower level living area as well as a loft style media or game room space, each with stunning views from the floor to ceiling windows out towards the beach and blue Pacific Ocean! Enjoy the incredible lifestyle that most people only dream of, being able to go from your front door to the beach sand in just a few steps! Play at the beach all day and then jump in your private pool for a relaxing swim! Then make your favorite drink and enjoy the world class sunsets right from your pool deck or second floor balcony! 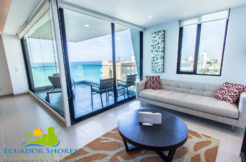 The area of Santa Marianita Beach is located just 15min South of Manta and gives residents the ability to live a more remote beach life away from the high rise condominiums, yet still close enough to enjoy all of he creature comforts that the city of Manta affords you! 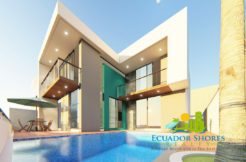 The area is also known to be the kite boarding capital of Ecuador whereby you can watch some incredible areal acrobatics from local and professional boarders, as well watch in amazement as the humpback whales pass by just offshore during the migration season! The home is estimated to be complete by April of 2018 and will most likely be sold prior to completion! Fair warning, do not delay on this incredible opportunity or someone else will certainly beat you to it! Contact us today for more information!